I really, really hate guns. If someone invited me out for some shooting, I would think he wants me to go taking photos with him. And this is exactly what happened to astrophotographer Marc Leatham. Some friends invited him to a bonfire shoot at Four Peaks Wilderness in Arizona. It was only when they got there that he realized they didn’t bring cameras – they brought guns instead. Marc has been into astrophotography for several years, and some friends from church invited him to go “shooting” with them. He didn’t know them well, but he knew they also had interest in night photography, so he came along. When they arrived to Four Peaks, one of the guys pulled out a highly modified assault rifle. Only then did Marc realize his mistake. He noticed that the ammunition burnt longer than usual for such a short barrel, so there was a lot more light to work with. His mind began to rush, thinking how he could incorporate the muzzle flash into the photo. He told the guys to stand still so he could take the shot at 25 sec shutter speed. He used a Sony a7 mirrorless camera, with 28-70mm lens at f/3.5 and ISO 800. Both he and the rest of the guys did a good job, since the photo has surprisingly little blur considering the long shutter speed. But thanks to photographic mind which understands “shooting” as something quite peaceful, he ended up with something similar, yet so different from his other work. And it was an experience I’m sure he’ll remember for a long time. If you’d like to see more of Marc’s work, like his Facebook page or follow him on Instagram. Say “photography” or “filming” instead of “shooting.” Someday there will be a disastrous misunderstanding. Everything about this article is just wrong, if not pathetic. Firstly, if you are starting the article with “I really, really hate guns”…don’t write the aricle; it’s bound to be skewed, and filled with inaccuracies about weapons. Like…..”the ammunition burnt longer”; that statement hurt my f*cking head. Also, that is NOT an assault rifle…at all…even a little…so, stop it. Also, (and I say this as both a photographer AND gun enthusiast) “shooting” a photo is no more or less ‘peaceful’ than shooting a gun, so again…stop it. Also, there is no reason, whatsoever, a 25-second exposure would be needed for this shot, except for the fact that he wanted to capture the stars (probably annoying the guys that were there to “go shooting”. Also, even being a photographer, I (anyone) would know that if someone asks you to go “shooting”, they are not talking about bringing your camera. This article is nothing more than an attempt to promote this photographer’s work, incorporating that little bit of “omg…they had GUNS!” shock value….a photographer who I did not bother with because, well, he’s obviously not that bright. The first line in the article discredits you as an unbiased source. You don’t start a journalism article with “I really, really hate guns.” That’s basics 101. Then you go on to expand on that with the misinformative sentence, “…one of the guys pulled out a highly modified assault rifle.” No, that is a standard semi automatic rifle. Same as a hunting rifle. An assault rifle is a complete different classification of weapon that usually falls under the rarely owned (because they are insanely expensive and have a small book of laws about their ownership) machine guns. Same goes for the ammunition. Don’t make yourself sound like an unbiased knowledgeable source, if you don’t have the slightest clue. In this case, the article should have been about how the photography was done, instead of pseudo-political posturing. It would be the same if I decided to write an article about model photography. I have fuckall for knowledge and experience in that field. So I avoid talking about it like I’m an expert, because I’ll look like an idiot and potentially ruin my reputation. That said, if you plan your shot to use the muzzle flash as a light source, the photos get to be pretty easy. It’s something I do fairly often. It is both sad and funny how people who don’t like guns try to paint everything as an assault rifle. I guess that wasn’t quite enough so it had to be highly modified too. Modified how? Did it have a scope … ooooooo? There is no more reason to “highly modify” a rifle than there is a camera. Just stop. But…but… that lens lets you take photos better at longer distances and that one is an assault lens. It lets you get more light to the image sensor. Nobody needs that. Don’t even get me started on the shoulder things that go up. Think of the children. All the photos of the children. It’s horrible. Okay, I’m having too much fun with this. Then there are those of us who modify our cameras to be more invisible for the assaults. Black gaffer tape over logos and shiny things. No logo shoulder straps. Lurking in the shadows. Oh lordy, he’s using quiet shutter and mup modes! It shoots a 30 SD card card in a half second. Ooooh Ooooh … shots triggered by laser traps or sound traps. I thought they were going to kill him, which would’ve been less weird. Yes, from your opening line I almost stopped reading. But it’s usually so much fun to see how little people that hate guns know about them. Congrats, on that point you did not disappoint me. 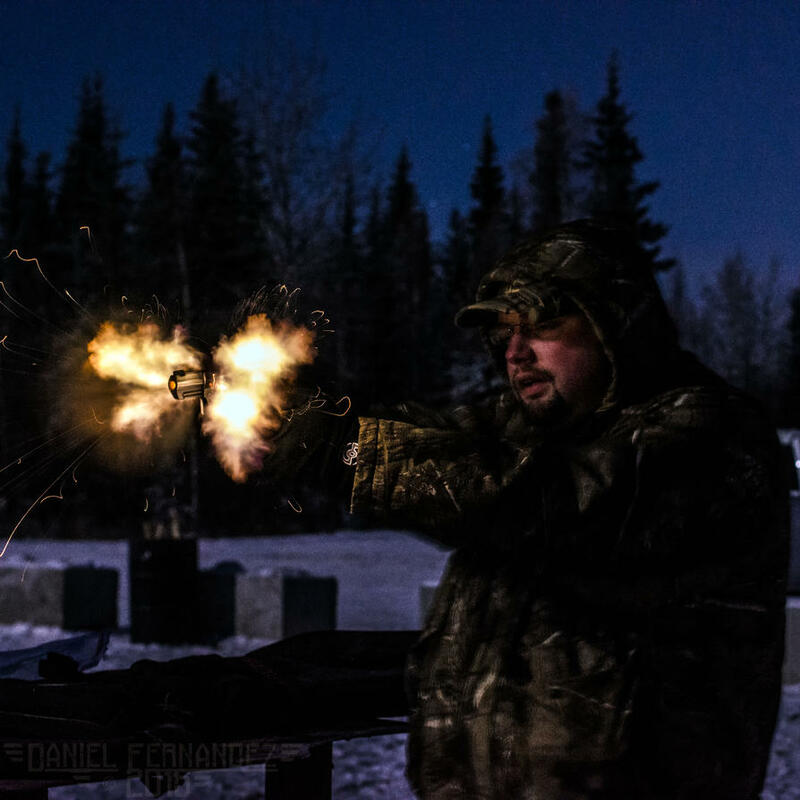 Imagine how much more fun this article could have been if you spent all your time talking about how to compose a decent shot of the night sky and muzzle flashes, you could have talked about the different patterns made by different flash suppressors. Maybe somebody could have brought a few tracer rounds. (Not sure if that’s legal in a park like that). Anyway, my point is, you could have actually made a useful article instead of one that makes the photographer look bad and shows your hatred of inanimate objects you know nothing about. For the record, I own three pistols, one of those scary black rifles, a 7D MKII, and not enough lenses. I also once craigslisted a macro lens for the money to buy a new pistol. And the “Clickbait Title of the Year” award goes to…. There doesn’t seem to be much comment from the anti-gun lobby; I guess they don’t want to argue with the boys and their toys. Here in the UK we just don’t get why American’s can legally carry guns in so many states. I think this all harks back to a typo in one of your amendments. The right to ‘bear arms’ should have read ‘bare arms’. So put away your stupid guns, roll up your sleeves and join the real world. God help us when Trump takes charge. Might have something to do with our history of having to repel tyrants who insisted on taxing and oppressing us without representation from an ocean away. You know … the ones who wouldn’t take no for an answer and thought they would bring their guns to our home and give us a lesson. The tyrants of the world have always insisted on the ones they are oppressing not having access to weapons and pretend they don’t understand. Perhaps you are confusing this with the right to bear grudges. Get over it; it is beyond living memory for most of us. LOL at the unwitting hypocrisy of the guy who started with an historical reference but tries to pretend using it against him is beyond living memory. Has nothing to do with a grudge. It has everything to do with learning from the past. That’s something the British don’t really seem smart enough to do even after your mostly disarmed population (see 1919) was easily over-run by Hitler. Don’t worry though. I’m sure we’ll bail you out again next time. Your post reeks of historical inaccuracy and self important ‘groupthink.’ You are referring to a group of people that debated for over a day about the placement of one single comma in the second amendment. Simply because it could change the interpretation of said amendment. So a typo is exceedingly unlikely. Doubly so considering the authors of the Bill of Rights were considered some of the most educated men of their time. Sorry, but your argument holds no more water than a slotted spoon. Wow, way to overdramatize the misunderstanding. Shame you let your bias ruin what could have been a fine article. You frame this as a mistake when it was a great opportunity on several fronts. First he’s been invited by new friends… how bad can that be? Second this is a new opportunity for some photos he won’t otherwise get. Third, he can STILL do night photography… no one would stop him. In fact I’ll be he’s a bit of a local hero at church for getting some great images the folks just don’t get. Frankly I can’t stand hockey… but I wouldn’t criticize people for inviting me to take some action shots at the rink. No one says I have to play. Ahhh, Trump has emboldened the gun nuts! Don’t you dare have a less than reverent view of guns! It’s just not allowed any more. Soon, we’ll all be required to own one, so you’d best get used to it. Oddly enough, almost all of the arguments within the comments are based off the content of the article and it’s bias and disinformation. So those are logical talking points. You however, immediately go for the emotional argument. That shows either a complete lack of understanding of the concepts within, or a lack of maturity to where you could debate on the merit of said arguments. Plus, you brought up Trump first. I’m so tired of winning, but there are no brakes on the Trump Train. Every troll needs a victim. Just like a gun, oddly enough. It always amazes how much Americans love their guns. You must realise that the huge number of gun homicides you have is a result of your desire to own deadly weapons. A population with lots of guns and relaxed laws will have lots of gun deaths. Some of you have complained this article is biased. So what – it doesn’t purport to be a news item. No offense, but with the statement of “A population with lots of guns and relaxed laws will have lots of gun deaths” shows a complete lack of knowledge about the firearms laws in the USA. Let alone how those statistics are compiled. There are over 20,000 gun laws on the books. Everything from who can own one, things that disqualify you, where you can carry them, what you can’t do with it, etc. Then there is a background check to own regular firearms and so on. Now firearms, the laws regarding them, politics thereof, and statistics from it, are a bunch of hot garbage. -case in point, there are an estimated 400 million firearms in America, with the people owning an average of around 2.1 trillion (yes I said trillion) rounds of ammunition legally. Statistically, you have an obscenely low percentage of getting killed by a legal firearm owner. -The government has a vested interest in skewing public opinion of said firearms. As such, they are on official record (released due to congressional inquiry) talking about, and breaking hundreds of laws to cause firearm crime so they can create new laws. Take Operation Gunrunner and it’s subprojects Castaway and Fast And Furious, where they (illegally) coerced dealers under threat of penalty to sell firearms to prohibited peoples, then literally delivered the firearms to the cartels, MS13, La Raza, etc. Simply so they could be used in crimes and traced back to the USA to pad statistics. This wasn’t uncovered until after a border patrol agent was murdered with one of those project weapons. -Not to mention the liberal application of firearm laws. Hell, look at what President Obama is doing with his pardons. People that are in prison for violent crimes involving firearms are getting pardoned. -The statistics themselves are skewed on purpose. The DOJ/FBI statistics used are aggregate numbers that don’t include the type of death, like lawful shooting by police officer, gang vs gang violence, etc. They just say death by firearm, death by knife, etc. -Then again, we’re back at the laws. Statistically the extreme majority (upward of 92% last I saw) of gang violence is through stolen or illegal weapons. The laws aren’t going to stop that. Chicago is one of the hardest cities in regards to firearms laws, yet they are the murder capitol of the US, averaging between 700-1000 a year. I think they hit 1300 last year. It’s almost as if criminals don’t follow the law. -Finally, after you disregard the government not following their own laws, criminals, legal homicides, etc, you are left with the odd crazies. That I will admit is a problem since the US does not have a working mental health system in any real capacity. If you want to truly reduce firearms violence in the US, the solution is simple really. Stop letting criminals off, enforce the laws on the books, stop lying in the media, get rid of corrupt politicians,* and fix the mental health system. Right there, I promise deaths will drop to new lows. Which, the US is at the lowest rate of firearm deaths in decades. *In the last few years, several prominent anti-gun politicians have been arrested for actions against their public standpoint. Case and point, California senator Leland Yee, incredibly anti-gun unless he is funneling them to the Triads. Of course, he gets a 5 year sentence in basically a minimum security resort, where someone else would be in the supermax. hiya, thanks for your long and detailed reply to my comment. I don’t think we’ll ever agree in this issue, but it’s interesting to see if from a different perspective. 20,000 gun laws? That sounds like a lot – I imagine very few people know or understand them. You compare the number of gun deaths with the amount of guns and ammo in your population, but the bottom line is you have lots of all those things. There logically has to be some causality between the number of guns and number of gun deaths, although the degree of that causality, I concede, is debatable. The old adage ‘follow the money’ I think best instructs us on how your gun laws and policies are ‘skewed’. A lot of money is made selling guns, ergo your gun lobby is the dominant force, not politicians acting for greater control of guns. I don’t know anything about the assertions you make about ‘creating gun crimes to pass gun laws’. Sounds like conspiracy theory. You have over 10k deaths a year – surely enough to lobby for tighter gun controls. On the first point, to stop letting criminals off, to me the number of people you have locked up is truly staggering https://en.wikipedia.org/wiki/Incarceration_in_the_United_States. So something isn’t working here, and your prisons must be at breaking point already. My solution – naive as it may be – is actually simple: Make private gun ownership illegal and do as much as possible to rid America of the 400million(!) guns you have. Incidentally, American politics is of interest to me and others in the UK because it tends to act as a template for us to follow, but hopefully not with regards guns. -A lot of money is made selling guns, ergo your gun lobby is the dominant force, not politicians acting for greater control of guns. On the other hand, the NRA lobbies for restructured firearms laws and enforcing the laws already on the books that aren’t enforced. The US Government has an epidemic of “if you can’t find a criminal, make one” in terms of laws lately. Case and point is a section of law called 922(r) that makes modifying imported firearms a crime unless you change a specific and arbitrary number of parts. It is largely used as an add on charge for arrests. -I don’t know anything about the assertions you make about ‘creating gun crimes to pass gun laws’. Sounds like conspiracy theory. You have over 10k deaths a year – surely enough to lobby for tighter gun controls. As I referenced before, look up Project Gunrunner, and it’s subsets of Operations. They are on congressional record talking about it. So official US Government documentation. As for the deaths per year, the Bill Whittle video I linked above is the best statistic breakdown. The deaths per year includes self defence by law enforcement and regular people, gang violence, suicides, etc. Aggregate statistics are not a valid point of specific documentation. The big difference is, the United States believes (as espoused in the writings of the founders, Constitution, Bill of Rights, and supported by the Supreme Court on multiple occasions) that the personal inalienable right is more important than the societal good. Any further laws are infringing on said rights. Continuing on to your end statement. The criminal justice system needs a complete overhaul. Beyond some insane arbitrary laws requiring prison sentences for nonviolent misdemeanor crimes (marijuana possession for example) the entire system is a mess. The majority of prisons are privately owned for profit outfits. Meaning there is less of an interest in justice and more of keeping inmate populations up so they can make money. To wit, many of those companies, including the Corrections Corporation of America, have signed contracts with the government to keep a certain number of inmates at any time, otherwise monetary penalties are assessed. America was founded on several ideals, one of which is the right of the individual to have the ability to defend themselves. The courts have upheld that it is an individual right, not a group right. To be blunt, there is a statistical zero sum of odds of that being changed. Guns are part of America. Not to mention that would do absolutely nothing about black market smuggled guns except increase the market. I did note that you didn’t say anything about the nonexistant mental health system though. We have veterans killing themselves daily because they are afraid to get help from the .gov. I’m saying that as someone who has lost friends and family for that exact reason btw. The VA gives veterans a second chance to die for their country, as their medical care is negligent at best, and criminal at worst. The mental health system in the rest of the country is about as poor. Instead of fixing the problem, the current trend in psychiatry and psychotherapy in the US is to medicate the problem, instead of discovering the root issue. Yes, a lot of conditions do require medication, however drugs that are less effective are overly prescribed, and proper ones are much less so. Finally, you also have to remember that the US population is just about 5 times larger than the UK population and over 40 times the land volume. So the scale is vastly different as well. re the Gunrunner op – just read the wiki entry – sounds like it could be a movie script! This morning I went to the outskirts of Tucson and intended to take pictures of the sunrise and rain clouds from a reddish hill located on state trust land. I was the first to arrive at the hill and hiked about three quarters to the crest when 4 bow hunters started to ascend the hill also. They clearly saw me (I was wearing red) and my camera/tripod but proceeded anyhow to set up their blinds around the circumference of the crest. I continued to take a few more pictures but ultimately left early as they were know blocking the view. Since that had lethal weapons and numbers I made no attempt to say anything to them. I politely left the area in a quiet manner so not to disturb any approaching wildlife. I wish they had been as considerate of me. I by no means want to lump all hunters and gun owners into a stereotype; however, I can honestly say that most of my encounters in the field have been with thoughtless, irresponsible individuals. I have no issues with gun ownership or hunting but gun owners could serve their cause better if they would realize they have to respect us also. A lot of people don’t realize what a lens has for a field of view. It’s impossible to know if they thought they were out of your view or not, since you didn’t talk to them. Let alone the implication that you think they’d have assaulted you for asking a question. No offense meant, but that’s a sign that you need to understand something better. Irrational fears are bad. Let alone that it was most likely public land during hunting season. As a heads up, lots of states have laws against interfering with a legal hunt. It can be up to a felony charge depending on location.